← HIIT – possibly the best workout…EVER!!! Starting out exercise and get sore muscles or a general feeling of stiffness a few days later? Changing a program and the next day you wake up sore? 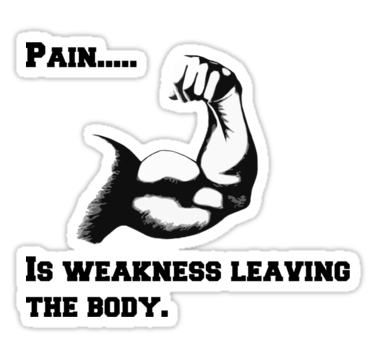 Moving onto strength training and using muscles you’ve never used before resulting in pain over the next few days? If ANY of these sound like scenarios you have been in or sound familiar, you may be suffering from classic DOMS! Delayed onset muscle soreness (DOMS) is the pain/stiffness/swelling associated with new/unusual exercises or movements that result several hours post activity. This can occur to ANYONE – those who are unaccustomed to exercise or those who exercise regularly and complete a random bout of strenuous exercise. When movement exceeds usual routine e.g. new exercise – weights, tabata, interval, endurance training etc. the muscles undergo micro-tears, resulting in fluid flowing through the muscles and eventuates into the feeling of soreness (from the muscle tears) and swelling (from plasma movement). It is more common when the muscle undergoes an eccentric phase (lengthening phase). The pain generally last no more than 72 hours and peaks at approximately 48 hours post exercise. HOW DO I KNOW I HAVE DOMS? If the pain lasts longer than 72 hours after exercise you may have done further damage to the muscle fibres that is beyond repair. It is important to consult your doctor if this is the case! HOW CAN I HELP MINIMISE DOMS? Ease yourself into ANY exercise regime – don’t go full guns blazing! For some, notebly athletes, DOMS are an embraceable event as they show they still have room for improvement in certain areas, but for the majority of us they are simply…PAINFUL. Posted in Uncategorized and tagged Delayed onset muscle soreness, DOms, eccentric, exercise, fitness, health, muscle, muscles, pain, physiology, soreness, strength, strenuous exercise. Bookmark the permalink.